This review of my Fuji GX 617 and my older Fuji G617, was written and Photographed by a good friend of mine, Bob Halligan. It appeared in its entirety in the Photographic Trader back in February 2006. The article is kindly reproduced here with the permission of the Author, Bob Halligan, and Nicole Chisholm of the Photographic Trader. For more on the usability of large format panoramic cameras, including the Fuji and the Linhof. Why I Changed to the Phase One XF-100 instead of the H6D-100. All words and images by Bob Halligan. Adam Monk, recently showed me these Fuji 6×17 panoramic cameras at his Monk Art Photography Gallery in Fremantle, and that is how I got my hands on all this gear without winning Lotto. The image above shows the Fuji G617 camera on the right and the Fuji GX617, its more sophisticated stablemate, on the left. They are designed in the 6x17cm format for 120 or 220 rollfilm (images size is actually 16.5×5.6cm), and while both use Fuji optics, the cameras show significant differences. The G617 has a fixed lens and an equally fixed viewfinder, but there are interchangeable lenses on the GX617 camera, each with its own interchangeable finder, and that is just for starters. The cameras are about 27cm long and weigh in at well over two kilos apiece, no matter which lens is in place. Even though the bodies have plastic mouldings to shape them for hand – held operation, they were never intended for casual snapshooting; you get only four shots on a 120 roll, do your own sums. 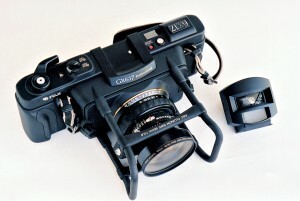 The fixed – lens G617 was introduced in 1982. The superb manual focus SW105mm / f8 Fujinon lens has a Seiko leaf shutter with speeds 1 – 1/500 sec and B, all mounted on a metal lens cone at the front of the camera. The fixed viewfinder covers 90 – 95% of the subject, but you have to squint a bit to see the edges if you wear specs, and there is no parallax adjustment; this is definitely a camera you have to get used to. I am told that there was also a G617 version with a Fujinon SWD.90mm / f5.6 lens, but I’ve yet to see one. The all metal body (barring the plastic grips at either end) is very strongly built, and the protective ‘cage’ of metal tubes around the lens makes the camera a hefty 19.5cm from front to back. The cage carries a pair of strap lugs on loose sleeves around the upper side tubes, and there is also a spirit level incorporated in the upper cross member. While there is no bubble to level the camera fore and aft to avoid the deadly curved horizon shot, note the two accessory shoes to the left of the finder. These are not hot shoes, but presumably one is for a flashgun, the other might well be for a circular bubble. Fuji scrapped both shoes when they produced the later GX617 camera and put a circular bubble in the vacant space on the top plate. They’d have done a lot better to put it in the viewfinder, like the el cheapo Russian Horizon 202 panorama camera, in my opinion! The camera layout is arranged so that all operations are right handed (even the latch for the camera back is on the right), leaving your left hand to look after the heavy body at all times. A big ratchet lever for the right thumb takes care of film advance, the circular window next to it keeps count of frames used, and the setting knob between window and finder selects for 120 or 220 film. You must match the film to the reversible pressure plate inside the back door before loading up. To prevent accidental double exposures, Fuji has coupled the film advance by an internal lever linkage to both the shutter release in the top of the wind – on lever and the release button (no socket) on the front panel. However, like a view camera, the shutter has to be cocked by a lever at the shutter casing up front and there is also the usual cable socket next to it, but remember there is no interlock if you use that one. And remember to squeeze a body release to unlock the film wind after an exposure from the front. The GX617, introduced in 1993, is clearly from the same ‘no nonsense’ Fuji design department. The two cameras look much the same,but the GX617 uses a strong metal chassis clad with ABS body panels, and also features important additions and improvements. The most obvious change is its interchangeable lens capability, and the lenses shown here are a Fuji SWD 90mm / f5.6 and a Fujinon W 180mm / f6.7, and I understand that 72mm and 300mm glass is also available as a special order. 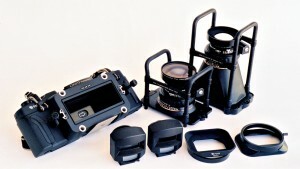 Each of the lenses has a Copal shutter with speeds 1 – 1/500 sec and B. The release button in the ratchet lever connects electronically to the ‘ solenoid bump’ on the rim of the shutter through gold contacts on the face of the mounting plate. There are matching contacts on the rear face of each lens mount, they probably replaced the internal cable connection of the G617 with electric tripping as a better way to deal with interchangeable lenses. 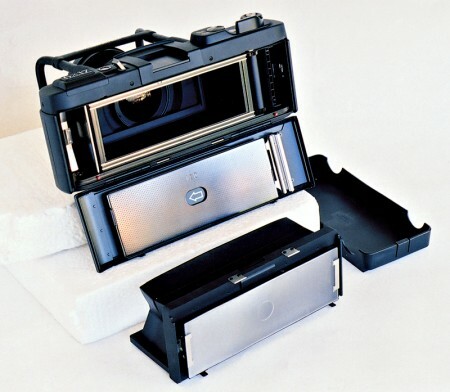 The film advance interlock and associated song and dance is the same as on the G617 camera, film can only be advanced after the release on the camera has been tripped. A normal cable release screws into the tapered socket on the solenoid bump, in fact this is the only way you can make a long exposure; the electric body release does not work on the B setting; presumably to save batteries. 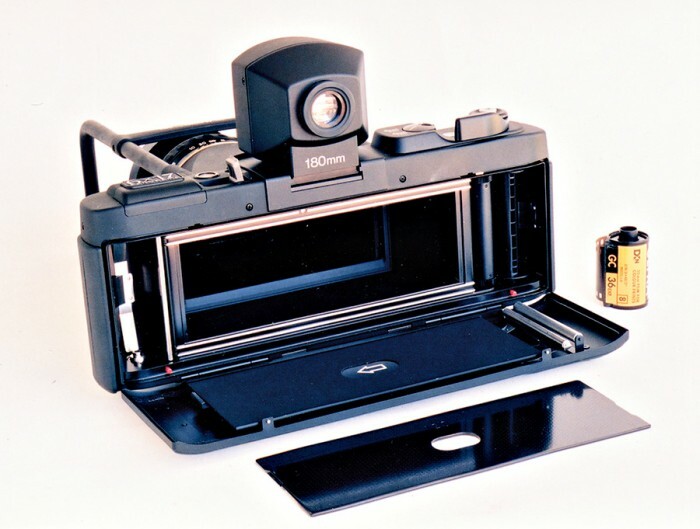 The wind – on levers and 120/220 film selectors are much the same on both cameras, but the GX617 frame counter is now in the square window between them. The GX617 top plate also shows changes to the left of the interchangeable viewfinder, where we find a small circular bubble level, a tiny red button to unlatch the viewfinder and a large, grey lift – up release lever that unlocks the camera back. Finally, there is a lithium battery for the electric shutter release under the raised plastic panel that says 6×17 PANORAMA, there is no longer a shutter release on the front of the body, and the camera strap is now attached directly to the body rather than the lens cage. Things are also a bit different round the back of the GX617. When you lift the grey release lever on the top plate, the back door does not swing sideways, it hinges downwards to completely clear the camera back for loading. This simple arrangement also allows a special focusing screen and hood assembly to be fitted, you simply hook the unit into the small stainless catches between the hinges, then swing it upwards into catches on the camera back. This is best done with the camera on a good tripod, because the door is left hanging below the level of the camera body, even when the screen is in use, so be careful. Once in position, the screen can be viewed for critical focus and framing for pictures like ‘vertical pans’, rigorous architectural work or tricky foreground situations. Adam tells me he has tried it, but Fuji’s modest lens openings mean the screen is pretty dim at full bore and very dark indeed at small apertures. And then, after all the eyestrain, you must remove the screen unit to load up the camera and get the shot… It is all a bit fiddly, Adam tells me, so the screen rarely leaves the neat storage unit you see alongside the camera in Photo 6. The GX617 body and lens mounts are very strongly built, because these lenses weigh more than a kilo apiece. The mounting plate, lens cone and safety cage assembly of each lens mates with the solid front of the body, where four deep locating sockets and two screw – down lugs (Photo 4) give a perfect fit. The new suspended frame viewfinders are much more kind to spectacle wearers than the optical finder of the G617, and can also take a dioptre correction lens and a rubber eyecup if you need them; but there is still no way to correct for parallax. The interchangeable lenses of the GX617 offer the photographer more flexibility, but note that lenses cannot be changed in the middle of a roll without some fancy work inside a changing bag. They are supplied with a dedicated finder and lenshood, but the 90mm lens needs a (very expensive) centre filter to equalise illumination of the enormous 6x17cm film area. If, in addition, you then want to use a polariser, expect to shell out on something special. You don’t need a centre filter for the longer lens. The image to the right shows the baseplates of the two cameras. 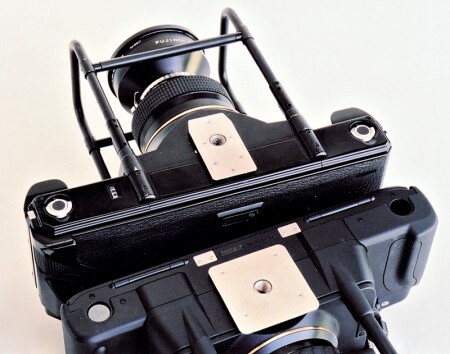 The GX617 has the large square plate around the tripod bush, and note also the two stainless clips for the focusing screen between the hinges. Neat circular buttons at each end of the baseplate carry the internal spigots for the film spools, they pop out when you push the little red buttons inside the camera body as you can see in the image below. The folding butterfly catches on the G617 do the same job, simply rotate them to pop out the film spigots. Film loading is very easy with either camera, both systems work beautifully. The small stainless catch at the left end of the G617 unlocks the side – hinged back door, and note also the small window in the baseplate. This three digit counter records every tenth exposure through the camera, allowing the meticulous photographer to keep his shutter maintenance up to scratch. There is no counter anywhere on the GX617 model, I imagine that with two lenses, that is to say two shutters, you’d need to be very meticulous indeed to handle the book keeping. And there you have it, two cameras with excellent lenses and precision bodies that produce outstanding panorama images, but be very sure and very picky before you squeeze any release buttons. Both cameras eat film at four shots a roll; to put this in perspective, take a look at Photo 8, where a lonely 35mm cassette contemplates the cavernous back of the GX 617 . Frightening, isn’t it?